Ten years ago Carley Cone Naramore, Epsilon Pi – Georgia Southern University was diagnosed with breast cancer and went through months of chemo, radiation, and surgeries to rebuild her health. During the summer of 2016, she began to experience serious and surprising complications with her heart. The doctors quickly assessed that the damage to her heart, from previous chemo and radiation, was so great she would need a new one within the year. 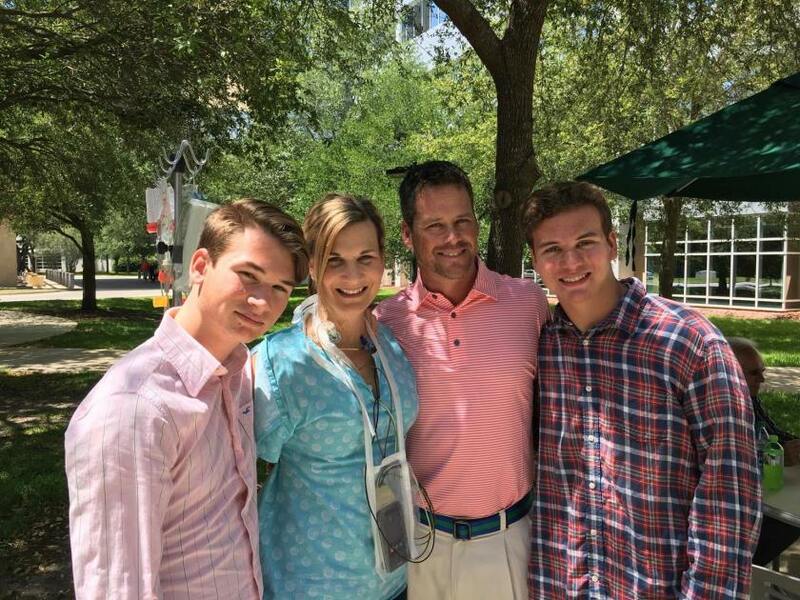 This news was a huge blow to her family, especially her husband and their two teenage boys. Carley’s sister, Cherie Cone Duffey, Epsilon Pi – Georgia Southern University reached out to the Alpha Delta Pi Foundation in March 2017 to inquire about the Clasped Hands Grant. Carley was given six months medical leave from work but with the uncertainty of what (and how much) insurance would cover, how long she’d be on the transplant list and living in The Mayo Clinic, and job retention during this process, there was a financial burden weighing the family down. Carley, with the help of her sister, applied and received a Clasped Hands Emergency Grant shortly thereafter. Carley was put on the heart donor list and took up residence at The Mayo Clinic in Jacksonville, FL ready to receive a heart as soon as one became available as a match. On June 15, 2017, just shy of 100 days at The Mayo Clinic, Carley received her new heart. Just three months post-transplant, she is powering through her recovery, exercising regularly (inside Target and Publix to beat the heat in Jacksonville), and continues to update her friends and family of her progress through her Facebook and blog. The best news, Carley reports there is a 0% rejection of her new heart. We are so thankful that we can help sisters like Carley, through the generosity of our sisters. Please visit our website to find more information on the Clasped Hands Fund Emergency Grant or to make a gift to this very important fund. With a grateful heart, we wish you a very Happy Thanksgiving from the Alpha Delta Pi Foundation Board of Trustees and staff.